Finally, it’s time for the most anticipated match in Indian football – the Kolkata Derby between East Bengal and Mohun Bagan. And it's only a few hours away. Termed one of the fiercest rivalries of the world, the Kolkata Derby will be a treat for football fans across the world. 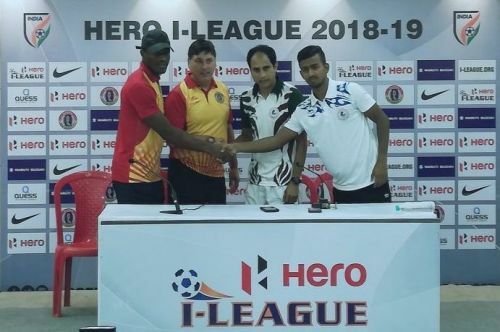 The two Kolkata giants will face each other for the first time in this edition’s I-League. Considering their standing on the league table, this match is equally important for both the teams. East Bengal and Mohun Bagan both have nine points from six matches, but the red and gold are two spots above their arch-rivals. A win for either side could boost the team's confidence for the rest of the season. East Bengal coach Alejandro Menendez, who was formerly associated with Real Madrid’s youth team, compared this game with El Clasico at the pre-match press conference. “Both the games are keenly contested and followed by a large number of supporters. We want to give our supporters a gift by winning this match,” the gaffer said. ALSO READ: Can Mohun Bagan cope without Sony Norde? For East Bengal, a win will not only put them ahead on the league table, but will also break the seven-match jinx. The Red and Gold have not won against their arch-rivals for more than 22 months, seven matches precisely. Three of them were draws while Mohun Bagan have snatched victories on the other four occasions. East Bengal's defence looked clueless in their first home match against Chennai City FC. The Spanish brigade of Chennai not only dominated in the opponent’s half, but also taught them how to play tiki-taka. It was thought before the start of the season that there would be good understanding between two Spanish-speaking defenders Borja Gomez and Johnny Acosta. The first two matches were relatively easy given the inability of their opponents. But the Chennai match was a real test for Borja and Acosta and they failed miserably. Their worst performance came against Aizawl FC, who exploited the gap and miscommunication between the defenders. A defeat to Minerva proved that something needs to be changed. Alejandro is an experienced coach and he didn’t take much time to find out the actual problem. World Cupper Johnny Acosta was benched and Salam Ranjan Singh was introduced in his place. To be honest, Salam was far better in his role against Gokulam Kerala. There is every possibility that Salam will start alongside Borja against Mohun Bagan. He has grown in confidence since that win over Gokulam and the coach could reward him with a first-team start again. The task could be easier for the defenders against Mohun Bagan. Sony Norde is already out of the match, which is a big advantage for the East Bengal defenders. Moreover, Henry Kisekka and Dipanda Dicka – Mohun Bagan’s two trusted lieutenants - are yet to find their rhythm. But they would need to be cautious too as both Dicka and Kisekka are capable of changing the match with just one move. If the Red and Gold defenders show more confidence, then the game could easily end in favour of East Bengal.